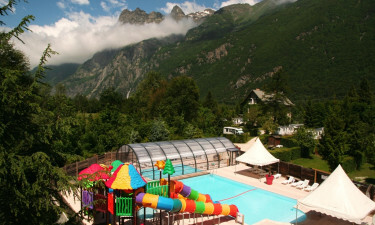 Surrounded by soaring peaks and beautiful valleys, Le Chateau de Rochetaillée is luxury camping site in the Oisans region of the French Alps. The well-equipped camping site delivers a five-star camping experience with a striking setting and superb amenities, including a deluxe swimming area. Set amidst three acres of woodland, this holiday camping site is on the grounds of a nineteenth-century stone manor house. 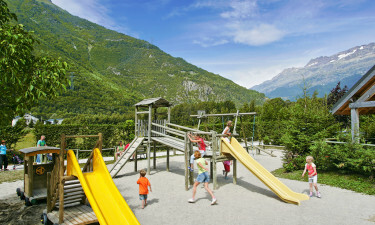 Camping Le Chateaux de Rochetaillée is about 40 kilometres from Grenoble close to Bourg d’Oisans. 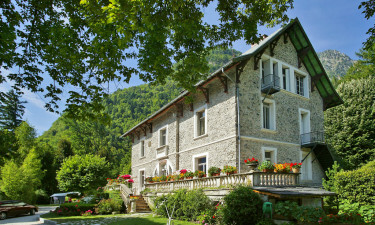 Enjoy an unforgettable stay and book your camping holiday at Le Chateau de Rochetaillée today with LuxCamp! Why Choose Camping Le Chateau de Rochetaillée? This luxury campground has everything you need to ensure a relaxing holiday. Wi-Fi access and laundry facilities are convenient perks, and there is a grocery shop with essentials for your stay. A spectacular restaurant offers intimate dining in an old vaulted cellar. Offering views of the surrounding mountains and woodland, this riverside campground has a spectacular aquatic area. There is a large outdoor pool with fun waterslides, plus a covered pool so you can still enjoy a swim on cooler or rainy days. A sauna and spa offer peaceful spots to relax during your holiday. This luxury camping destination has plenty of free activities for campers of all ages, including mini golf, volleyball and basketball. The campground has a gym, football field, a rock climbing wall, and a playground. There are also ping pong and table tennis tables plus a lawn bowling green.